The Vitro Rotary Bottle washing Machine is compact and highly efficient machine with elegant look. This multi functional multi featured machine meets the GMP requirements of washing for glass and plastic bottles. 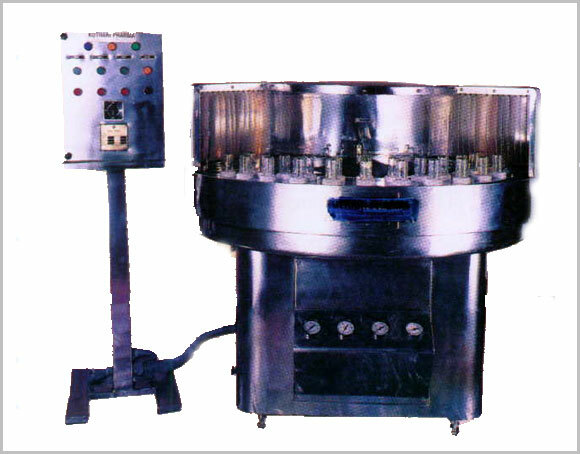 The machine operates on the Rotary principle with “GENEVA” mechanism and requires manual loading and unloading of bottles. Four inner and one outer wash.
Sequence of washes to customer’s choice. Suitable to wash 5ml to 500ml bottles. Output: 64 to 100 bottles per minute. Meets GMP and FDA norms. The bottles are loaded on rotating platform and are cleaned in series of operations. The bottle are hold in bottle holders which are specially designed to accomodate bottles with varying neck diameter and bottle diameter. The bottles are placed in an inverted position in these cup shaped holders. The external cleaning of the bottles is done by spraying showers. Solenoid valves are provided to enable the regulation of wash timings and sequence of various washing media to suit specific requirement. Max. dia. of bottle 85 mm. 1) S.S. tanks capacity 75 lts. (2 nos.). No. of pumps 2 2) Centrifugal pump with T.C.v/s T.C. seal. main drive 1 HP / 3 phase 4) 64 nos. specially designed bottleholders. Overall dimm. (mm) 1700Lx1900Wx1300 H 5) Stand mounted panelboard. Individual solenoid valve for each washing sequence which eliminates carbon plate and other accessories reduces leakage and maintenance to minimum. Variable speed drive for out put between 64 & 100 bottles per minute.